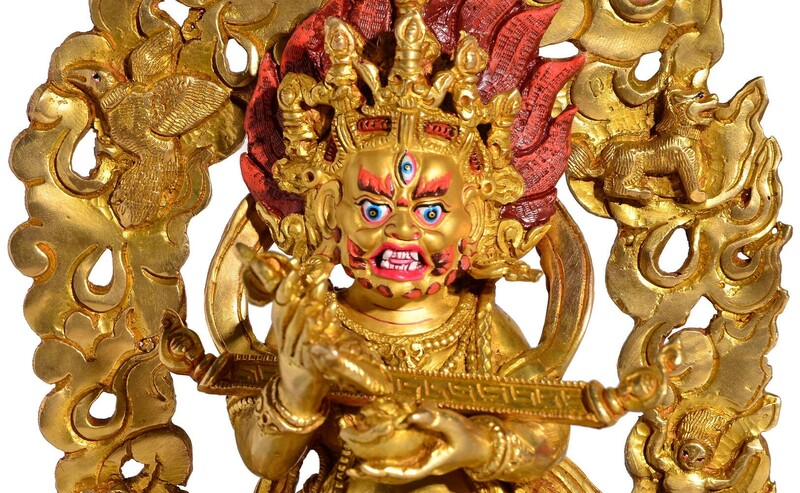 Für Details zum Produkt "Mahakala 26 cm vollfeuervergoldet Replica Statue" scrollen Sie bitte nach unten. Tibetische Buddhastatue aus Bronze. 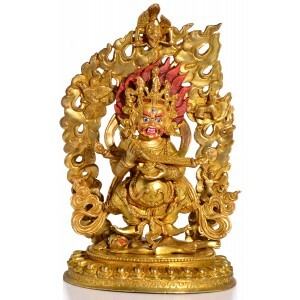 Mahakala vollfeuervergoldete Replica 26 cm hoch 2,1 kg schwer. 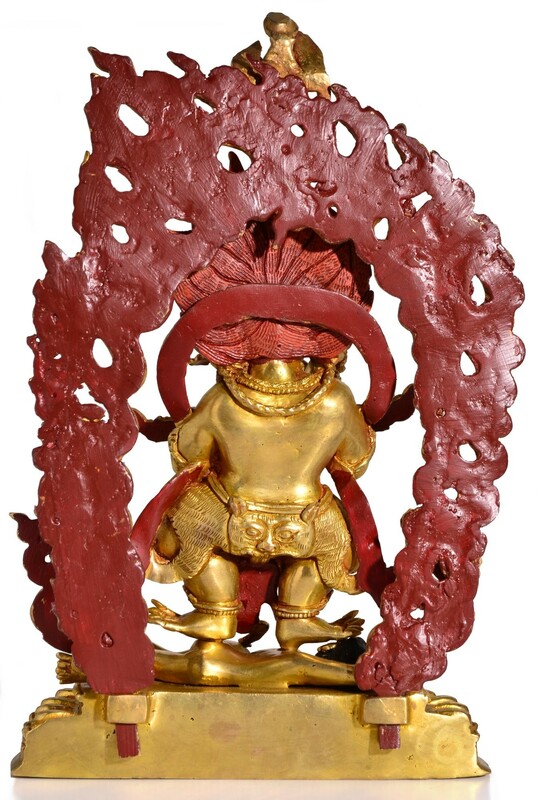 Mahakala - Pranjaranatha (protector of tents) Mahakala is a diety worshipped both by Hindu and buddhists. He is one of the Hindu dietes of the Brahma group. He is one of the eight terrible dieteis of Buddhist pantheon. 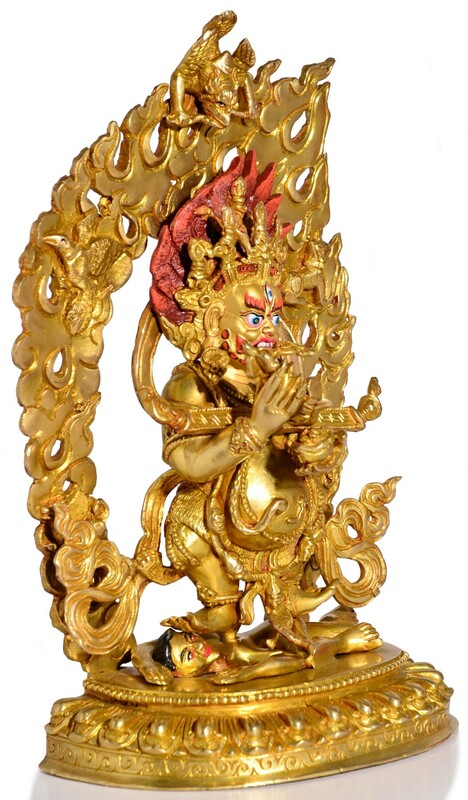 He can be seen in the enterance of every Buddhist monastries in Kathmandu valley. In Nepalese buddhist tradition two armed form of Mahakala carved in stones is found in large number. He is dark blue in colour, he looks wrathful bedecked with ornaments of serpents. He wears a garland of severed heads and a crown of five skulls symbolizing the five defilements. 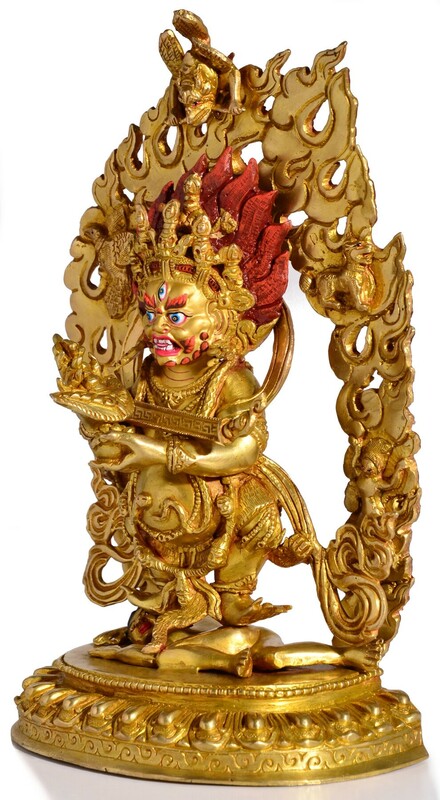 His right hand holds Kartri symbolizing that it can cut ego-clinging and attachemnt and his left hand hols a kapala filled with blood symbolizing the subjungation of evil ones.He wears a tiger skin symbolizing the purification of desire, He has three eyes symbolizinng his clear comprehension of three times. He looks ferrocious against the blazing fire. His mouth is smeared with blood signifying that he is active in eliminating evils. One attribute he holds a bundle of tent poles, he is also the protector of Mongolia and protector of tents. 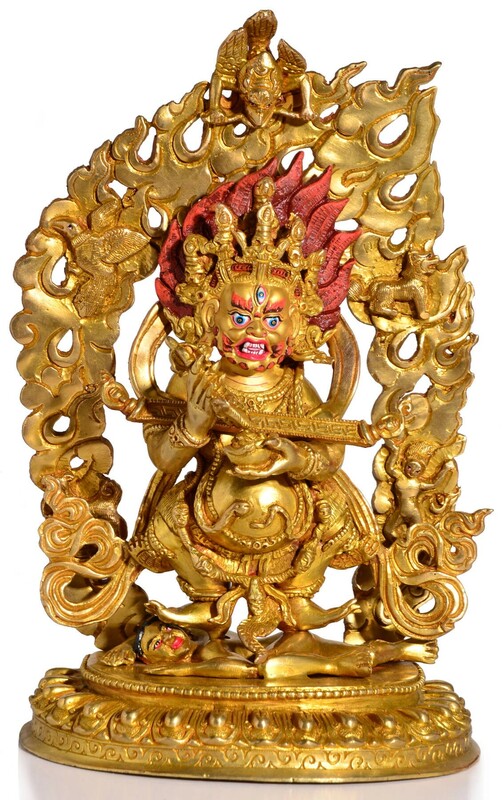 It is said that Mahakala is the manifestation of bodhisattva Avalokiteshvara, From the heart of Arya Avalokiteshvara emerged a dark blue Hung letter, which is transformed into the Instantaneous Protector of wisdom. Buddha Amitabha proclaimed thus, `son of family, you shall have the strength of the wrathful Yama, Lord of death. You shall have the mountain spirits, the yakshas, the devils and the demonesses as your messengers. You shall embody the great wrathful empowerments of the body, speech, mind, qualities and activities of all the Buddhas throughout the three times.